There are many colloquialisms which we state with regularity. "Absence makes the heart grow fonder," is one example. "Patience is a virtue" is another. Do you ever pause to wonder where theses phrases come from and why we say them? "Patience is a virtue" is a notion that's widely accepted, but when did we first start saying it? We need to take a long walk back through history to find out. What Does "Patience Is a Virtue" Mean? This sentiment is a reflection upon someone's ability to wait for something. By calling patience a virtue, or state of moral excellence, it leads people to believe an ability to wait without agitation is an admirable quality. Part of the reason this has been a long-standing truth throughout history is because patience often goes against our instincts. It's something everyone struggles with, including our earliest ancestors. The good news is, patience is a skill that can be learned over time. The more we exercise patience, the less likely we are to become agitated when forced to wait for something. Mastering this virtue will make for a happier life. That's certainly one of the reasons why it's so famously touted by writers and philosophers alike. Origins of "Patience Is a Virtue"
Like many of the famous sayings we recite today, the original author of "Patience is a virtue" is hard to pin down. Some date it back to Cato to the Elder in the third or fourth century. Others attribute it to The Canterbury Tales, written during the 14th century. Since literature is quite fluid and shared by many, writers often observe similar concepts and themes. It can be difficult to attribute commonly accepted thoughts or reflections to one individual. Let's take a look at some of the famous writers who may have coined this now-common colloquialism. Dating back to the third or fourth century, we know of The Distichs of Cato, commonly referred to as Cato. This was a Latin collection of proverbial wisdom and morality, becoming the most popular Latin textbook in the Middle Ages. It was considered not only a textbook for learning Latin, but good morals, too. Assumed to have been written by Cato the Elder, there is a line in this text that reads, "Of human virtues, patience is most great." While this is a striking statement in defense of patience, Cato often gets overlooked as the originator of this sentiment. Other research dates this saying back to the fifth century. It was then that Latin poet Prudentius wrote a near thousand-line epic poem, Psychomania, describing the conflict between vice and virtue. The main characters were Hope, Sobriety, Chastity, and Humility, as they fought against Pride, Wrath, Paganism, and Avarice. Although the famous line "Patience is a virtue" isn't expressly stated in Psychomania, it's one of the earliest recorded attempts at highlighting patience as a virtue, or state of moral excellence. It's most commonly believed that the line originated from the poem, Piers Plowman, said to have been written around 1360 by English poet William Langland, about a man in search of faith. One line in the poem states that "patience is a fair virtue." The poem is an allegory, meaning the characters are symbolic and satirical. However, the allegory isn't vague or abstract. Langland followed a similar pattern to Prudentius and used personification to illustrate human virtues. The main characters in this poem include Truth (God), Wrong (Devil), Holy Church, Thought, Wit, Study, Conscience, Liar, Reason, Dowel (do well), Dobet (do better) and Dobest (do best), plus the seven deadly sins. The characters are lead on a quest by Piers Plowman. Plowman is chosen as the guide due to his state of moral excellence. Ten years later, Geoffrey Chaucer's The Canterbury Tales started to gain notoriety. This is another story, or series of stories, detailing virtue's place in one's life. The characters in each tale embark on pilgrimages, motivated by love, and characterized by self-denial and contrition. In The Canterbury Tales, we find a similar quote, "Patience is a high virtue." While these pilgrimages were marked by virtuous behavior, it's made clear that the practice of patience made for a more contented journey, even in the face of self-denial and contrition. Interestingly enough, Chaucer referred to Cato in Canterbury Tales. He wrote, "He knew not Catoun, for his wit was rude." Although he doesn't cite patience directly, Chaucer alludes to Cato's text as being an authority on morality. So we can see that "patience is a virtue" has long been touted as a universal truth. Common sentiments such as this often make their way into the literature of the time, which makes it difficult to pinpoint the exact origin of the phrase since the quote may have already been known to people through an oral story tradition. The battle against impatience has been constant, through every generation. In the end, if patience is victorious, we're well positioned to live a happier, more virtuous life, in that highly regarded state of moral excellence. While we continue on our path to such excellence, enjoy some more quotes by these wise men, including Geoffrey Chaucer and William Langland. "Who Said \"Patience Is a Virtue\"?." YourDictionary, n.d. Web. 20 April 2019. 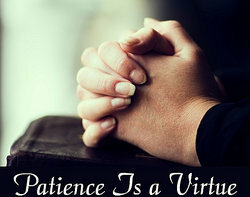 <https://quotes.yourdictionary.com/articles/who-said-patience-is-a-virtue.html>.